My cousin Liz Dean (a criminal lawyer - aren't they all!) 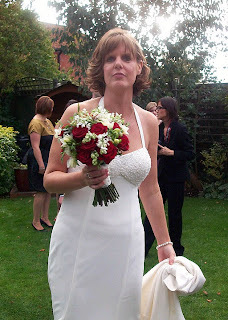 got married to her partner David in Nottingham on Saturday and became Mrs Corder - like the name. As you can see she looked stunning. Sophie and I, our girls and my brother had a great time. It was a typical British wedding - with all the colourful characters and expected eccentricities. First there was Rachel, one of David's cousins and her family. Rachel was a loud, warm, flamboyant and formidable woman with a big hat (apparently it was a fascinater - not a hat!). She was delighted to be to be commanding a table with her family of cousins from one-side of the family arrayed along one-side of the table and my family - cousins from the other side of the new family on t'other. Rachel kept everyone in check and ordered members of her family to move to different seats at regular intervals - 'so they could get to know everyone'. Her family complied swiftly and without demur - clearly they had learned many years ago that resistance would be futile. After a couple of glasses of wine Rachel excitedly caught hold of the idea that the day's event, the new union of our families, provided a new and fabulous range of social possibilities - I am a little concerned she may turn up unannounced to stay with us for a few weeks over Christmas with seven or eight of her manservants (male family members). Half way thro the meal Rachel's aged father (86), who I was sitting opposite (having been ordered to do so by Rachel - I didn't argue as her husband shot me a warning look when I hesitated) announced quietly that he was going to Holland to see his brother, who had died. Whilst being slightly concerned that he should finish his dinner before embarking on the long journey, I immediately expressed my condolences. Richard explained that it was all right as he had got over it as his brother had died in 1944. Richard then told Dani (my 12 year old) and I about how his brother had fought in various places thro' the early years of the war in various battles, before training as a glider pilot. He managed to successfully land his glider near Arnhem in 1944 and decant his troops. Tragically following various exploits, including destroying a german tank single-handedly, he was killed during the fighting retreat. The day was greatly enhanced by the arrival of Granville, a man I think of as an uncle, but who in fact was a very close friend of my mum and her two brothers when they were growing up. Granville is a nuclear-physicist who literally generates warmth when he enters a room - I suspect that may be as a result of too much exposure to radioactive material. Granville had the air of someone who had been released from prison for the day. 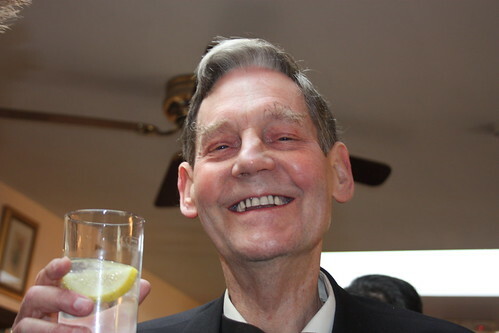 He gleefully announced that he was ignoring the advice of his doctors about abstaining from drink whilst on medication, and was going to have a good ole drink. He then proceeded to made a creditable dent in a bottle of gin - well done Granville! Steve, an ex-work colleague and friend of Liz's was another bright and interesting character. He explained that he had worked in criminal law with Liz some years ago before moving on to work in licensing law. Steve explained that in the event that I should decide to open a lap-dancing club, he would be ideally placed to help me gain the necessary clearances. I was delighted that such a fortuitous meeting had occurred and immediately felt the future looked brighter and redolent with opportunity. This perfect day even provided a bit of politics as my Auntie Trudy (A Kent LibDem County Councillor) and I gave a few of the usual issues a brief airing.. I resisted the temptation to pick a fight over a political issue. It would have seemed wrong on the day her daughter was married - although I suspect she might have enjoyed it. What a great day.. It was with regret that we turned on to the M1 the following morning and headed back down South - I wished my Mum (and Dad) were there but sadly she has been suffering from the return of the dreaded cancer... but that's another story.